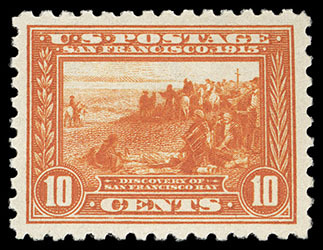 1913, 5¢ Panama-Pacific, perf 12, o.g., very lightly hinged, beautifully centered amid mammoth margins, intensely rich color, a Superb jumbo, the only hinged example to obtain this grade with only one higher; with 2005 P.F. certificate Graded (S 98J, SMQ $450). 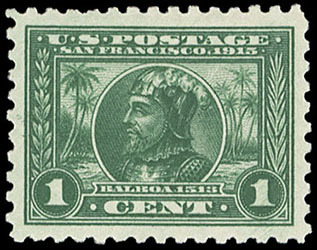 1914, 1¢ Panama-Pacific, perf 10, o.g., never hinged, exceptional centering amid large beautifully balanced margins, rich deep color and Post Office fresh, Extremely Fine to Superb, a lovely gem; with 1997 P.F. and 2015 P.S.E. certificates, the latter Graded (XF-Sup 95, SMQ $325). 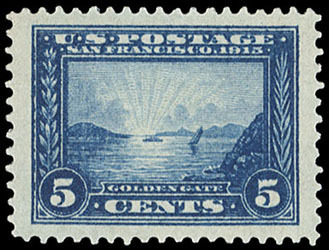 1915, 5¢ Panama-Pacific, perf 10, dark blue shade, o.g., never hinged, nicely centered amid well proportioned margins, beautiful deep dark blue shade, Very Fine and choice, seldom encountered in this very scarce shade; with 1984 P.F. certificate. 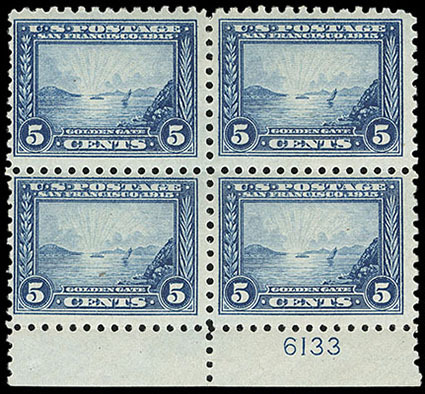 1915, 5¢ Panama-Pacific, perf 10, bottom margin block of 4 with plate number, o.g., hinged at top, bottom stamps never hinged, strong color, bright and fresh, F.-V.F. 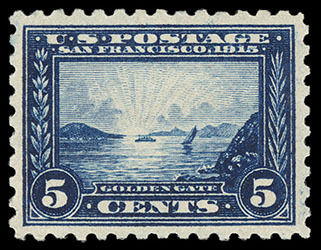 1915, 10¢ Panama-Pacific, perf 10, o.g., never hinged, choice centering amid well balanced margins, rich vibrant color and Post Office fresh, Extremely Fine, a gorgeous stamp; with 1987 P.F. certificate.